The author argues that the ratio of metaphor and comparison is an important question for understanding the essence and mechanisms of metaphor formation, and thus for explaining many profound linguistic processes. The view of the metaphor as a reduced (collapsed) comparison was unquestionably preserved since the time of Aristotle, and only in the last 50–70 years has been shaken by new discoveries in semasiology. The article proves that metaphor and comparison are not a modification of one semantic phenomenon and not a stage of a single semantic process, but essentially independent linguistic phenomena that reveal differences in logical, semantic and structural aspects. Keywords: metaphor; comparison; reference; semasiology; semantic model; lexicography. The article discusses the construction “infinitive + the word ending in ‘-o’”, trying to determine the place of such words in the parts of speech system. The sentences with this construction are regarded as two-part and/or one-piece, personal and impersonal, which is determined by the phenomenon of transition in Russian language system. Keywords: infinitive; category of state; functional homonyms; transient phenomena. Th e article is dedicated to the changes of traditional journalistic language with the emergence of such phenomena of journalism / pseudojournalism as “blogs”, with their “normative” use of colloquialisms and jargon. The author also discusses the processes of rapid development in the scientific and technical spheres, and their influence on modern Russian language with its lack of necessary lexical units for designating new concepts and phenomena. Keywords: media texts; traditional journalistic language; blogs; colloquialisms. The article analyses contamination of oral and written speech forms as a main trend of Internet language development on material of travel and adventure blogs. Firstly, the author defines varieties of lexical and grammatical units in blogosphere and their frequency without regard to any particular text (“segmental informality”). Secondly, she raises the question of relationships between texts typology and lexical and grammatical markers of informality (“textual informality”). Keywords: Internet; blogosphere; lexical markers of informality; grammatical markers of informality. The authors explore some theoretical and methodical problems of understanding and usage of address forms in colloquial speech, and argue that modern Russian language situation indicates a certain “lacunarity” of these forms in comparison with other Slavic languages, or demonstrates the use of wide-spread conversation clichés in everyday communication, formal and especially informal. The paper analyzes modern Russian language etiquette of address forms in comparison with other Slavic languages, particularly Serbian. Keywords: address forms; Slavic languages; stylistics; teaching method; Russian as a foreign language. The article analyses the linguistic means of verbalization of the frame structure of nomination of “One Belt, One Road” Chinese State Initiative in Russian newspaper discourse, demonstrating its multi-component structure, where the frames represent tactics of the strategy implementation, and the slot units concretize the implementation of tactics. Keywords: “One Belt One Road”; frame; slot. 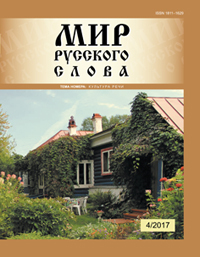 The article presents the model of formation of linguocultural and lexicographic skills of foreign undergraduates studying the theory and methodology of Russian language teaching, and shows the possibilities of their training in the areas of selection, commenting and lexicographic description of ethnoculturally marked linguistic units on material of a literary text. Keywords: Russian as a foreign language; lexicography; linguoculturology; figurative comparisons. The author proves that in his book “Frigate ‘Pallada’” Goncharov has realized the hidden opportunities of the “literary travelogue” genre, which seemed quite familiar to the 19th century readers. In particular, the writer was creatively using the symbolic meaning of the “path” motive. While refusing to follow the “story line”, Goncharov has acquired, so to speak, the right to aesthetical detachment, and has implemented the inner plot of the book, i.e. his thoughts and reflections about the travelogue he was creating; this second plot has not been fully understood yet. Keywords: travelogue; symbol; plot; genre; humor. The article deals with the stylistic and compositional features of two notes written by Lara, characteristic for her image creation in the novel, reflecting her inner world, and expressing the author’s position. They exist in the narrative-composition unity with many characters and events of “Doctor Zhivago”, and their interpretation can help to comprehend the integrity of the heroine’s character. Keywords: Pasternak; “Doctor Zhivago”; composition; notes by Lara. Melodramatism and tragiсalness are viewed in the article as two main worldview-psychological registers, in accordance to which people model and format their discourses. Melodramatic component plays a key role in most Russian classic works of literature, co-existing and interacting with the tragic one. The algorithm of the Russian novel is generally based on switching the narration from melodramatic to tragic mode. Keywords: melodramatism; tragiсalness; the philosophy of resentment; the philosophy of guilt; melodramatic catharsis. 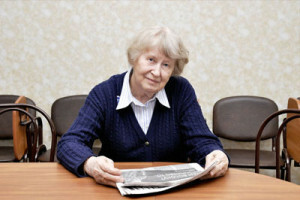 The article analyzes Elena M. Tager’s poem “Twenty Years After” (1959), which was a response to the statement of “tinkering with rehabilitated people” by famous novelist and playwright Vera F. Panova. The conflict of the two worldviews was associated with contradiction between personal experiences and different understandings of what had happened with the country in the Stalinist period. Elena M. Tager refers to the fate of her contemporaries suffered from the repressive state machine, such as writers Boris Pilnyak, Osip Mandelstam, and Boris Pasternak). Keywords: conflict; thematic field; lyrical hero; author’s position. The article examines the role and place of cognitive linguodidactics among other cognitive sciences, and analyzes the influence of such cognitive sciences as psychology, anthropology, sociology, linguistics on cognitive linguodidactics. Keywords: cognitive linguodidactics; cognitive psychology; cognitive anthropology; cognitive linguistics; language; thinking. The article elicits bottlenecks arising while selecting lexico-semantic variants of the prepositions to be included into A2 level (common language) teaching content alongside with some moot points of prepositional presentation in the key standard methodical documents of this level. The authors also raise the questions referring to continuity of level descriptions and to accurate categorizing of adverbial prepositions. Keywords: preposition; Russian as a foreign language tests; level A2; common language; basic dictionary; state standard; linguodidactic program. The article presents the results of the research of Russian language communicative spheres of foreign students in non-philologist Russian universities. The authors base their work on the assumption that communicative spheres are determined by students’ needs, and propose the classification of modern person’s needs related to their communicative spheres. The article gives a review of the research of Russian language communicative spheres received during the questionnaire survey of 200 foreign non-philologist students in five St. Petersburg and Moscow universities, and concludes that there is an incomplete correspondence between students’ communicative needs and their images in their teacher’s appreciation. Keywords: Russian as a foreign language; teaching methods; non-philological specialization; communicative spheres; communicative needs. Current Trends in Paremiology. The review of the book: Seliverstova E. I. Prostranstvo russkoi poslovitsy. Postoianstvo i izmenchivost’ [Space of Russian Proverb. Constancy and variability: monograph]. — Moscow: Flinta and Nauka, 2017. — 296 p.
Khrolenko A. T. Vvedenie v ekofilologiiu [Introduction to the Ecophilology: training manual]. — Moscow: Flinta and Nauka, 2017. — 264 p.
The paper deals with the problem of Konstantin Paustovsky’s individual style, and highlights the lyrical tone as its dominant feature. The author discusses the lyrical tone as a text category, defines its characteristics, identifies the means of its formation. The analysis is performed on material of the short stories “The Snow”, “A Rainy Dawn” “The Cordon 273”, “Summer in Voronezh”, and other works by the writer. Keywords: the literary text; author’s style; tone of speech; subtext; Konstantin Paustovsky.